Collaborative – specify WP roles allowed to be coworkers. They can work together for the same service, but keep their own Google Calendars for planning! Yes. All the Google Calendar possibilities are perfectly matched by Team Booking! Can I place a slot without an ending time, i.e. appointments with unknown duration? 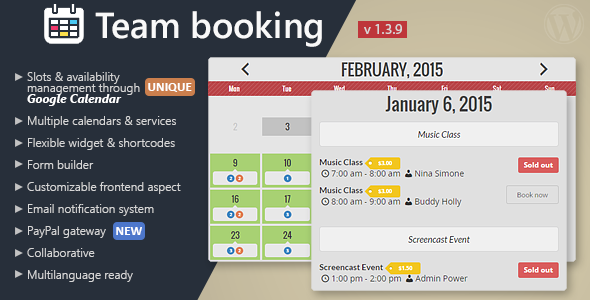 Team booking is developed and tested with WordPress 3.8+ and strictly requiresPHP 5.3+. PHP 5.2’s end of life date was back on 2011. Using old versions may expose you or your clients to security vulnerabilities and bugs that have been fixed in more recent versions of PHP. This entry was posted in Calendars and tagged accomodation, ajax calendar, appointments, booking, calendar, event, Event List, event manager, fitness, lesson, meeting, reservations, wordpress, wordpress calendar, wordpress plugin on July 14, 2015 by Vera Jaman. This entry was posted in Calendars and tagged appointments, booking, calendar, plugin, reservations, wordpress on June 17, 2015 by Vera Jaman. 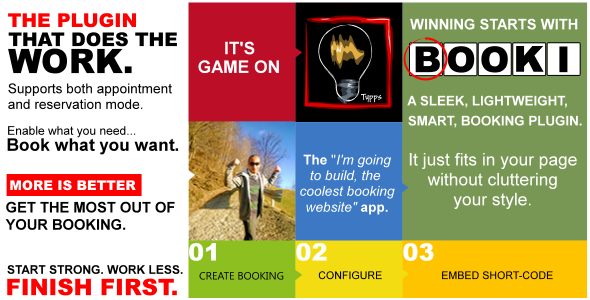 To see some of the things you can accomplish with Booki, check outhttp://www.booki.io/demo/. Please note that these are quick examples and we will certainly add more in time. You can certainly accomplish so much more. When in doubt ask pre-sale questions in the comments. When confused, please ask pre-sale questions in the comments section. Thank you. Unlimited booking projects. Each project has it’s own unique options that make up a booking calendar, which you can add on any page or post so that your customers can book online. Unlimited service providers. A service provider can manage their booking project in your backend. Each service provider can additionally sync bookings (one-way) to their google calendar profile. Stats page for a quick overview of your bookings and summary information. Service providers too get a stats page to view summary data on a project they manage. Confirm bookings—automatically confirm bookings as they are made or manually confirm bookings one at a time. Your customer will be notified when a booking is confirmed. Cancel a booking. Your customer will receive a notification of the cancellation. 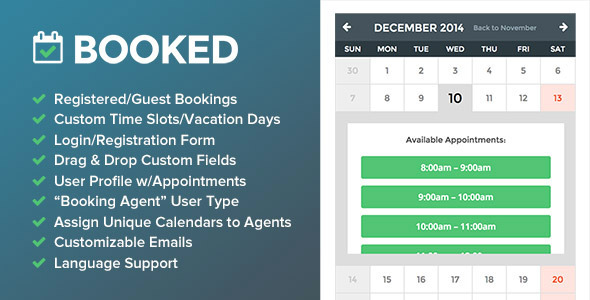 Create bookings from your backend and send these out to your customers. 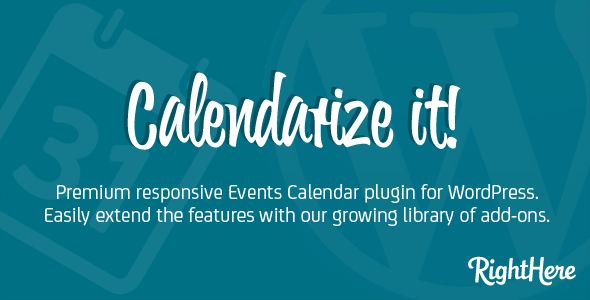 Control how your calendar functions by selecting a calendar mode: Popup, Inline, Range or Nextday checkout or Events. Single or Multiple day(s) or time slot(s) booking by setting a minimum and maximum limit. Enable payments online via PayPal Express with guest checkout. Enable offline payments via book now pay later options. Send invoices to clients with payment link to PayPal Express or include your own instructions in the email containing the invoice. Enable both book now pay later and PayPal Express payments at the same time. Email templates. Customize all emails sent out by the system individually with your own custom layout editing the master email template. Set minimum notice and prevent people from booking too soon, allowing you a minimum notice period to make arrangements. Unlimited Google Calendar profiles. Sync your booking(one-way) with google calendar as soon as they are made on your site. Custom form fields. 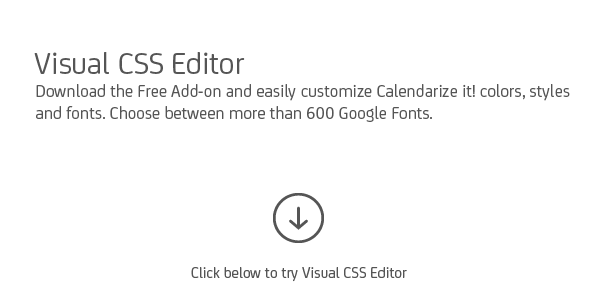 Create a booking form to collect additional information along with the booking. Set up costs for your booking period. Costs can vary by the day or time slot. Set up appointment reminders. The system can send an email before the booking starts. Coupons. Setup coupons that your customers can claim during checkout. Bookings are recorded in your backend. Manage each booking as an order where you can send invoices for unpaid bookings, approve or deny a booking or simply view the entire record. Separate view of bookings shown as they are made with full details of who made them along with any custom form fields data and extras included during booking. 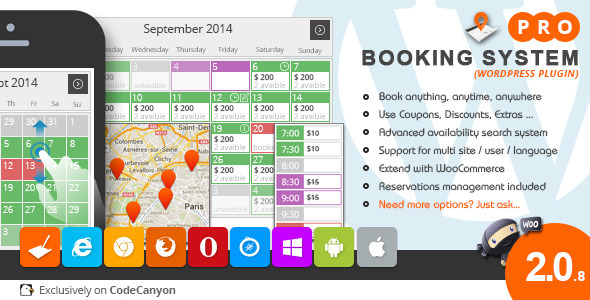 Additionally calendar view of bookings is also included. Enable non-registered OR registered users to make bookings. Registered users get a booking history page where they can login and view past bookings and pay for unpaid bookings directly from their history page. Set up seasons—a season can consist of a day or group of days where you can setup holiday rates. Quantity elements—quantity elements allow you to allow customers chose a quantities that have varying costs. Quantity can also be finite i.e. as a quantity is selected, it will get deducted from the total quantity you have setup for a day, time slot or entire booking period. Unlimited Optional extras as radio button lists or checkbox lists. Setup additional optional items with cost that your customers can select during their booking. Can be configured to apply for a single/multiple day(s) or time slot(s) selected. Unlimited Dropdownlists or cascading lists for extras with cost. Cascades can be setup where a choice in one dropdownlist will load a secondary list and so forth to an infinite level. The customer choices trail is registered. Display list of attendees in your booking form with attendee name, date and time slot booked and status. All strings translatable via *.mo and *.po files or via WPML, the very best plugin for translations. Main strings are additionally editable from the backend. This entry was posted in Calendars and tagged accommodation, appointment, booking, calendar, events, fitness, lesson, meeting, parking, rental, reservation, taxi, teacher, tickets, wordpress booking on June 16, 2015 by Vera Jaman. 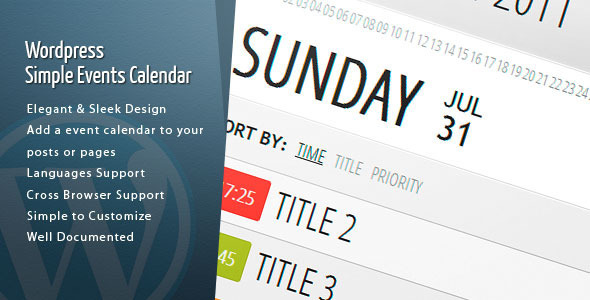 This entry was posted in Calendars and tagged calendar, clean, design, elegant, events, jquery, modern, optimized, professional, simple, unique, wordpress on May 29, 2015 by Vera Jaman. This entry was posted in Calendars and tagged calendar, clean, dates, drag, elegant, events, jquery, modern, optimized, pro, professional, responsive, sleek, unique, wordpress on April 26, 2015 by Vera Jaman. Downloadable Content and Add-ons for Calendarize it! With Calendarize it! version 2.0 we introduce Downloadable Content. When you enter your License Key in the Options Panel you will be able to access Downloads. You can download free add-ons like our new Visual CSS Editor and the Contexual Help for Calendarize it! as well as buy premium add-ons. With Calendarize it! 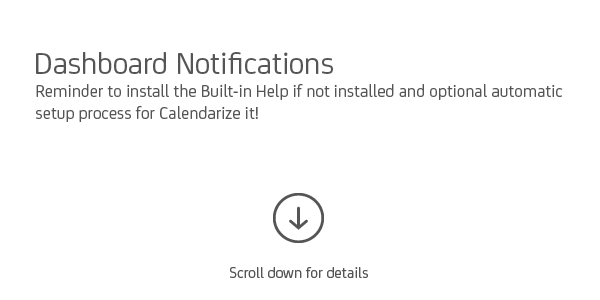 2.0 we introduce the Layout Builder for the Event and Venue Box. It makes it super easy to customize the layout and add custom fields as well as setup default templates. 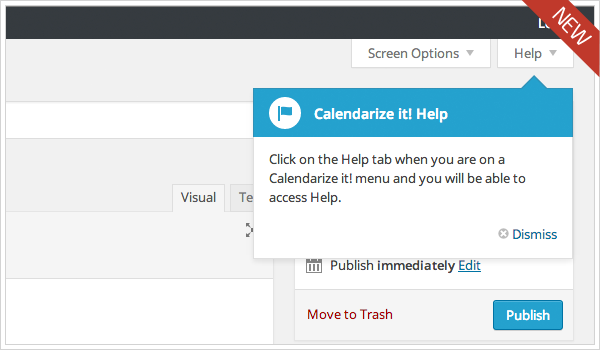 You can now update Calendarize it! for WordPress directly from within WordPress admin. All you need to do is enter your Item Purchase Code (License Key) in the Options Panel. 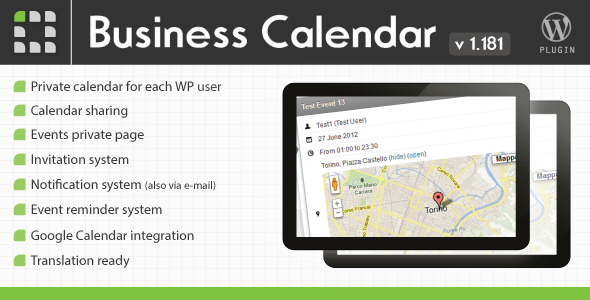 It is easy to add new events with the “point and click” visual calendar interface in wp-admin. Click on the day, enter the start day/time and end day/time. You will get a preview of the event in the calendar in the wp-admin. Easily add recurring events: every day, every week, every 2 weeks, every month, every year, and if you select More Options you can choose to repeat events multiple times the same day, hour. You can also choose between settings like 1st, 2nd, 3rd, 4th, 5th or last. With the release of Calendarize it! for WordPress version 1.2 it is now possible to create Arbitrary Recurring Events easily. First you create your recurring event and then you can repeat it when ever you want, including changing the time of the day when it repeats. You can also create Recurring Events and then easily remove specific dates (exceptions). 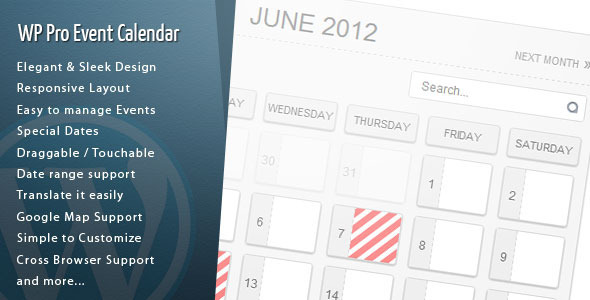 You can easily display calendars for individual users in WordPress simply by adding a Shortcode with the username. You can also display events from multiple users by adding the id number of the user instead of the username. Calendarize it! for WordPress supports Custom Taxonomies and by using these you can apply advanced filtering when viewing the Calendar in the front end. By default all events will be showing unless you have inserted a Shortcode with filtering. Click on a Custom Taxonomy and click “Apply filters”. You can add the filters in any combination. And click “Show All” in order to remove all filters. 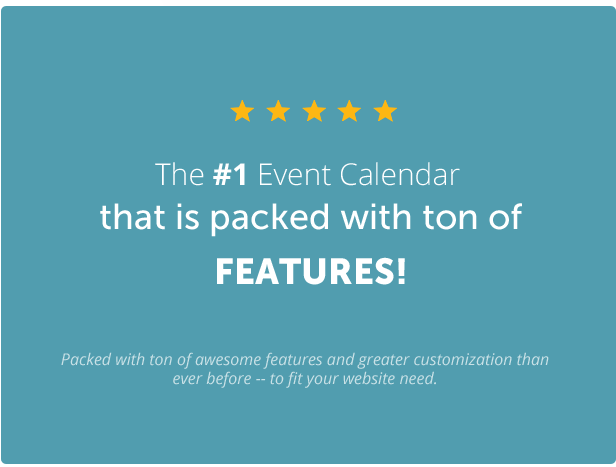 Insert a Mini Events Calendar widget in your sidebar. Apply advanced filtering with Custom Taxonomies. Choose between different jQuery UI skins. 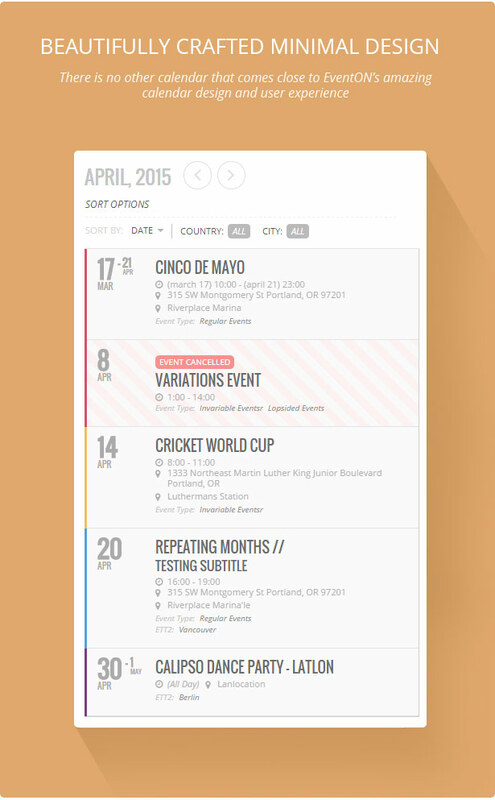 Insert a Upcoming Events widget in your sidebar. Apply advanced filtering with Custom Taxonomies. Switch directly from either Monthly, Weekly or Daily view to “event” and view all events from the Month, the Week or the Day. When creating your event you can easily add Custom Fields. Choose between three different types of Custom Fields: Custom, Taxonomy or Metadata. 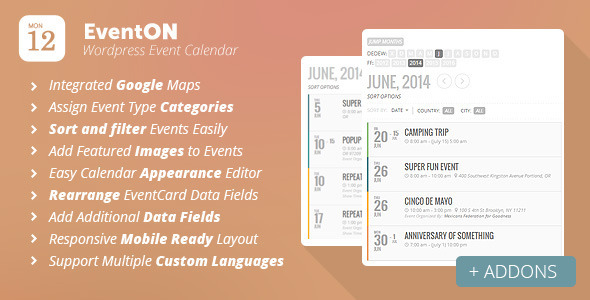 Assign events to specific Calendars, Organizers and Venues. Create detailed Venue page. We have created 8 different Shortcodes that you can use with Calendarize it! 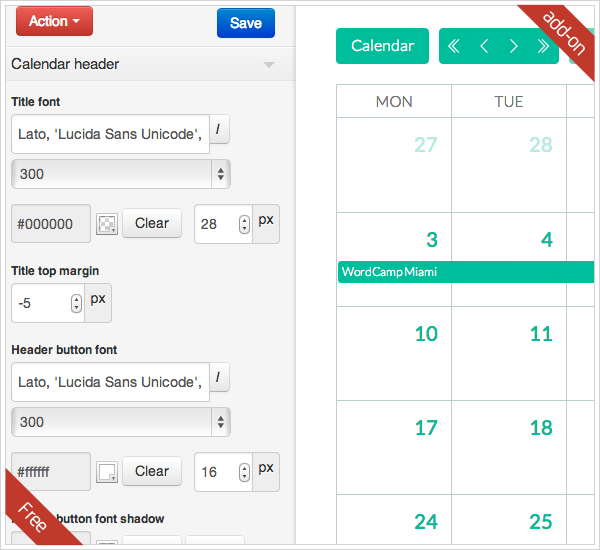 From a very Shortcode to insert the calendar to more advanced Shortcodes that allow you to apply different filters. You can activate Calendarize it! for Custom Post Types including Posts and Pages. This means you can make these show as “events” in the calendar. With Custom Capabilities you can customize who has access to the different features. Please notice that you need a Role and Capability Manager in order to use the Custom Capabilities. You can either use our White Label Branding for WordPress, which has a build in Role and Capability Manager, or try one of the free plugins available on the internet. We have implemented comprehensive support for customizing the Time and Date format. You can completely customize the Time and Date format for the following views: month, week, day and event list. This also includes setting 12 hour or 24 hour time format . If you have our Pages by User Role for WordPress plugin you will able to set the access to each event by User Role. You can either provide access or block specific user roles. This makes it possible to show one calendar, but depending on the visitors user role they will see different events in the calendar. Each event has a detailed Event Page where you can add information. Each event has a detailed Venue Page where you can add information about the venue. Below the venue information we will display any upcoming events from the venue. Both the Event Page and Venue Page supports Google Maps. Calendarize it! 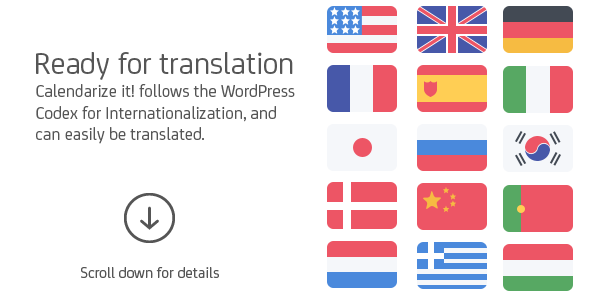 for WordPress comply with the Codex for internationalization. This is a process of making an application ready for translation. In WordPress this means making strings which should be translated in a special way. 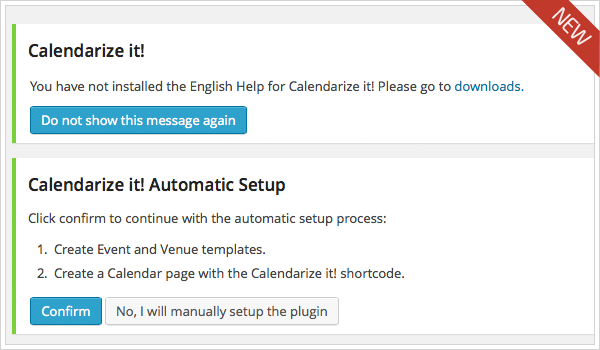 If you have our Easy Translation Manager for WordPress you can easily translate Calendarize it! for WordPress. This entry was posted in Calendars and tagged arbitrary events, calendar, Event List, events calendar, google map, paid events, public submit events, ratings, recurring events, responsive layouts, rsvp, wordpress calendar plugin on March 23, 2015 by Vera Jaman. This entry was posted in Calendars and tagged appointment, availability, book, booking, booking system, calendar, hotel, management, organizer, payment, rent, reservation, schedule, service, woocommerce on March 15, 2015 by Vera Jaman. This entry was posted in Calendars and tagged event calendar, event calendar AJAX, event calendar google maps, eventbrite integrated calendar, Events List, Events wordpres plguin, paid event calendar on March 7, 2015 by Vera Jaman.